Rebounders are seen by personal trainers and fitness enthusiasts everywhere as essential for any low-impact exercise program. Like any other products, however, some are good while some are way bellow par, which is why you would do best to know what you’re dealing with before making any sort of purchase. As a rule, a high-quality rebounder will have a solid metal framing, a stabilizing design, a durable surface material, and reliable springs. 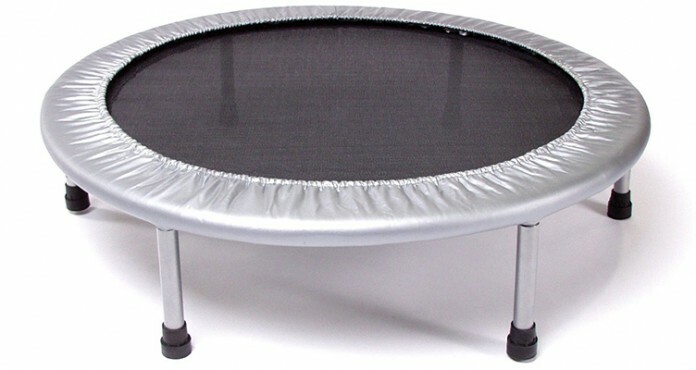 After searching far and wide for the best mini trampolines on the market today, we came up with a list of the ten best rebounders and mini trampolines money can buy that you absolutely need to check out if you’re interested in acquiring one anytime soon. This 36-inch folding trampoline offers a safe, progressive, and extremely offensive way to exercise thanks to its thirty-band tension resistance. Each of these bands is two inches wide and is designed to provide maximum stability even when under tremendous amounts of pressure. It has a rugged all-steel frame construction, six detachable rubber-tipped legs, and a heavy-duty rebounding surface with a safety pad for good measure. This particular rebounder strengthens your core while improving balance and coordination due to its heavy duty springs that provide a surprisingly stable and even resistance to pressure. 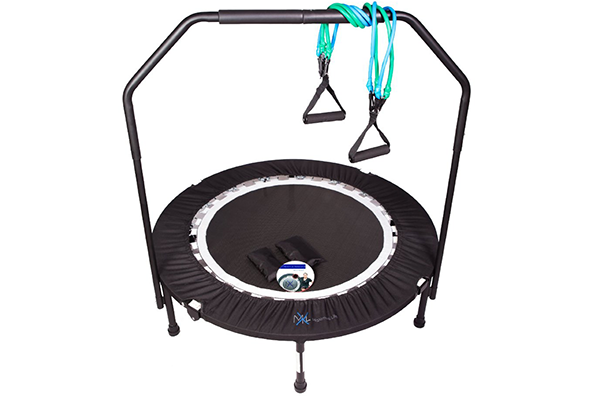 It includes not only the commercial-quality mini trampoline that you require but also a stabilizing bar that you will definitely find very useful during long exercising sessions. Also, the Urban Rebounder has a 300 lbs capacity, thus accommodating people of any size and weight. Designed to be stable and responsive, this rebounder provides a great amount of stability and security while helping you get the most out of each workout session. Thanks to its design, it helps you train coordination and balance with the help of its 30 EnduroLast 2 cords which can resist more than 1 million cycles. Constructed in a sleek fashion, it features a black, quality 2-coat finish, a striking black frame with black arched legs, and a 39-inch frame with Skirted mat bound to provide a bit of comfort as well as stability. Extremely robust, the Pro Quarter mini trampoline from MaXimus is one of the best-selling mini trampolines on the market and rightfully so. 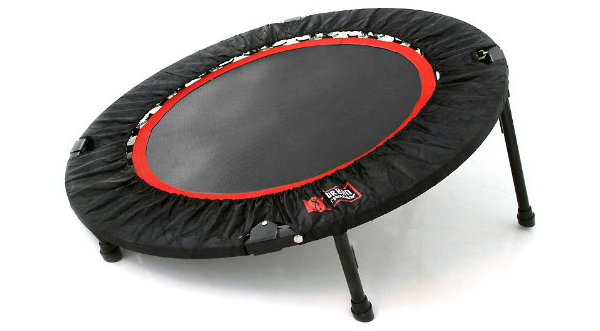 While some rebounders / mini trampolines take up unnecessary space when idle, this particular rebounder can be folded in half, making it easy to store or transport. Its huge jumbo coiled springs and double cross stitched mat give it a very resilient and low impact bounce that you will definitely appreciate during long training sessions while its specially designed resistance bands with karabiner clip for the springs make it extremely sturdy. Providing a soft, resilient bounce, the Half-Fold rebounder is unlikely to break or show any signs of damage from regular use. This is mainly due to its durable high-impact materials and workmanship which also come accompanied by the manufacturer’s all-component lifetime warranty. Equipped with a Permatron mat, this mini trampoline folds in half for added convenience and to our knowledge, is virtually unbreakable. 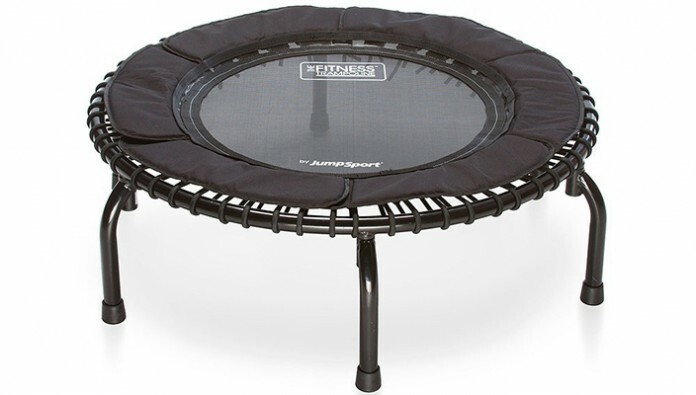 The Fitness Trampoline 350 from JumpSport features 3 EnduroLast elastic cords designed to sustain millions of bounces, a 32.5-inch Permatron jumping surface for added stability, and a sturdy 39-inch non-folding frame with strong back legs. It also has 30 adjustable cords with 3 adjustable tension settings for different types of workouts. Furthermore, this high-quality 3-coat rebounder comes with a workout DVD to help you through. David Hall’s Cellerciser Rebounder Trampoline Kit comes packing everything you need to get the most out of your workout sessions. 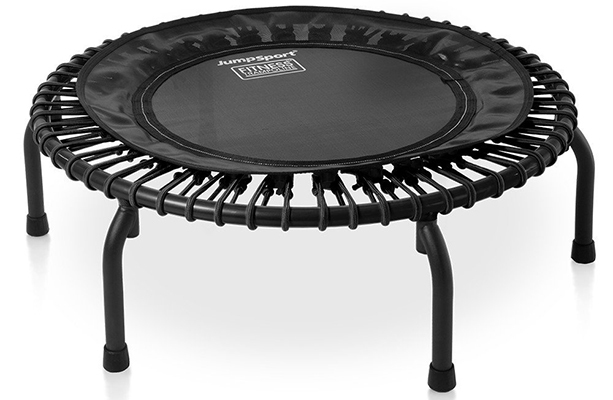 The rebounder itself has a 40-inch frame with a 28-inch rebounding mat and 36 springs. Its stable legs are 8.5-inch long, sustaining the mat at a 10.5-inch elevation above the ground. It also comes with a stabilizing bar that can be set to 3 different heights while its all-steel construction with Electroplated finish makes it very strong. 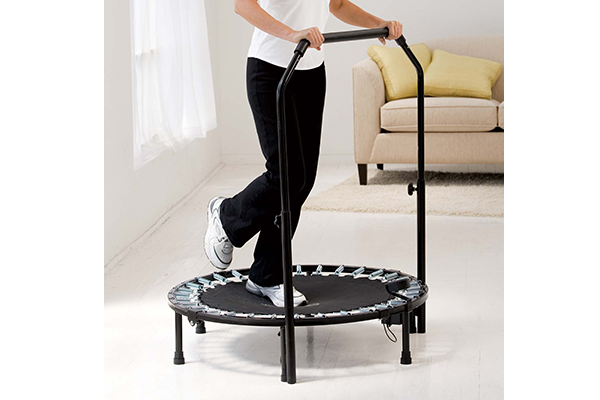 This professional gym rebounder is great for fitness and sports training, weight loss, lymphatic drainage, joint stability training, and much more. Due to its folding spring loaded legs, it will not only sustain people who are 130 kg or more, but will allow you to fold it easily when you’re done. We should point out that Pro Gym is used by many professional athletes nowadays, mainly due to its low impact bounce provided by its advanced large spring system. Designed in a sleep fashion, this particular mini trampoline has a striking black frame with black arched legs that give it a very professional look overall. It has a 39-inch diameter frame with a Padded petal mat for added comfort, and surface area that uses 30 EnduroLast 2 cords rated for one million cycles. Thanks to its FlexBounce III technology, you can adjust the tension and firmness of the bounce while its smooth, cushioned cords provide a quite lively bounce. JumpSport is well-known for making high-quality rebounders and the Fitness Model 220 is no different. Although non-foldable, this rebounder compensates by being extremely sturdy and stable, features that it owes to its strong, arched legs. It uses a skirted mat which covers the EnduroLast 2 cords and connectors that give this resilient rebounder a smooth yet lively bounce. We should also point out that it comes with a workout DVD to help you with your exercising.